WARNING: Failure to follow these safety instructions could result in fire, electric shock, or other injuries, or damage to Gibi device or other property. Read all the safety information below before using Gibi device. Handle Gibi device with care. It is made of metal, glass, and plastic and has sensitive electronic components inside. Gibi device can be damaged if dropped, burned, punctured, or crushed. Don’t use a damaged Gibi device, such as one that is cracked, as it may cause injury. If you’re concerned about scratching the surface of Gibi device, consider using a Gibi decal. Don’t open Gibi device and don’t attempt to repair Gibi device by yourself. Disassembling Gibi device may damage it or may cause injury to you. If Gibi device is damaged, or malfunctions contact Gibi or a Gibi Authorized Service Provider. You can find more information about getting service by contacting support@gibitechnologies.com. Don’t attempt to replace the Gibi device battery yourself—you may damage the battery, which could cause overheating and injury. The lithium polymer battery in Gibi device should be replaced only by Gibi or a Gibi Authorized Service Provider, and must be recycled or disposed of separately from household waste. Don’t incinerate the battery. For information about battery recycling and replacement, see getgibi.com/battery-recycling-and-replacement. Using Gibi in some circumstances can distract you and may cause a dangerous situation. Observe rules that prohibit or restrict the use of mobile phones (for example, avoid using the Gibi app while driving a car). Gibi User Guide Review the user guide before using Gibi. Go to getgibi.com/userguide. Retain documentation for future reference. Safety and Handling See “Safety, Handling, & Support” in the Gibi User Guide at getgibi.com/gibi-quick-start-guide/. Exposure to Radio Frequency Energy This device is designed to be used on pets. Go to getgibi.com/rfexposure. Battery The lithium-polymer battery in Gibi should be replaced only by Gibi Technologies Inc. or a Gibi Authorized Service Provider, and must be recycled or disposed of separately from household waste. For information about battery recycling and replacement, go to getgibi.com/battery-recycling-and-replacement. Charging and discharging The Gibi device is powered by a rechargeable battery. When the battery voltage drops below low battery threshold, the device needs to be charged. The battery can be charged and discharged hundreds of times, but it will eventually wear out. Recharge Gibi device only with Gibi Technologies Inc. approved chargers designated for this Gibi device. Unplug the charger from the electrical plug and the Gibi device when not in use. Do not leave a fully charged battery connected to a charger, since overcharging may shorten its lifetime. If left unused, a fully charged battery will lose its charge over time. Never use any charger that is damaged. Leaving the Gibi device in hot or cold places, such as in a closed car in summer or winter conditions, will reduce the capacity and lifetime of the battery. Gibi device and its power adapter comply with applicable surface temperature standards and limits. However, even within these limits, sustained contact with warm surfaces for long periods of time may cause discomfort or injury. Use common sense to avoid situations where your skin or your pet’s skin is in contact with a device or its power adapter when it’s operating or plugged into a power source for long periods of time. For example, don’t sleep or place a device or power adapter under a blanket, pillow, or your body when it’s plugged into a power source. It’s important to keep Gibi device and its power adapter in a well-ventilated area when using or charging them. Take special care if you have a physical condition that affects your ability to detect heat against the body. Gibi device uses radio signals to connect to wireless networks. For information about the amount of power used to transmit these signals, see www.getgibi.com/rfexposure. Observe signs and notices that prohibit or restrict the use of mobile phones (for example, in healthcare facilities or blasting areas). Although Gibi device is designed, tested, and manufactured to comply with regulations governing radio frequency emissions, such emissions from Gibi device can negatively affect the operation of other electronic equipment, causing them to malfunction. Turn off Gibi device or use Sleep Mode to turn off the Gibi device wireless transmitters when use is prohibited, such as while traveling in aircraft, or when asked to do so by authorities. Gibi device contains radios that emit electromagnetic fields. These electromagnetic fields may interfere with pacemakers, defibrillators, or other medical devices. Maintain at least 6 inches (approximately 15 cm) of separation between your pacemaker or defibrillator and Gibi device. If you suspect Gibi device is interfering with your pacemaker or any other medical device, stop using Gibi device and consult your physician for information specific to your medical device. 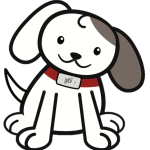 If you or your pet have any other medical condition that you believe could be affected by Gibi device (for example, seizures, blackouts, eyestrain, or headaches), consult with your physician or veterinarian prior to using Gibi device. Do not charge or use Gibi device in any area with a potentially explosive atmosphere, such as a fueling area, or in areas where the air contains chemicals or particles (such as grain, dust, or metal powders). Obey all signs and instructions. This device is not intended for use where the failure of the device could lead to death, personal injury, or severe environmental damage. Some Gibi device accessories may present a choking hazard to small children. Keep these accessories away from small children. Turn Gibi device off (press and hold the on/off button until the light flashes amber and stops). Use a soft, lint-free cloth. Rinse with fresh tap water if Gibi device exposed to salt water. Never force a Gibi device into a Gibi collar clip or apply excessive pressure to the on/off button, because this may cause damage that is not covered under the warranty. If the Gibi device and Gibi collar clip don’t join with reasonable ease, the collar may be threaded on the Gibi collar clip incorrectly. Check for obstructions and make sure that you have threaded the collar through the Gibi collar clip correctly. Gibi device is designed to work in ambient temperatures between 0° and 122° F (-5° and 95° C) and stored in temperatures between -40° and 113° F (-40° and 176° C). Gibi device can be damaged and battery life shortened if stored or operated outside of these temperature ranges. Avoid exposing Gibi device to dramatic changes in temperature. When you’re using Gibi device or charging the battery, it is normal for Gibi device to get warm. If the interior temperature of Gibi device exceeds normal operating temperatures (for example, in a hot car or in direct sunlight for extended periods of time), Gibi device may stop charging or operating. IMPORTANT: Move Gibi device to a cooler location out of direct sunlight and wait a few minutes before trying to use Gibi device again. Contact Gibi for personalized support by emailing support@gibitechnologies.com. Also check out our FAQ. If something isn’t working right, try restarting Gibi device or resetting Gibi device. Hold down the ON/OFF button until the light flashes amber and stops. To turn Gibi device back on, hold down the ON/OFF button until the light is green. The light will turn off after restarting is complete. You can find the below information on the original packaging and the bottom of Gibi device. Sell or give away Gibi device? Before you sell or give away your Gibi device, please contact Customer Support at support@gibitechnologies.com. Changes or modifications not expressly approved by the party responsible for compliance could void the user‘s authority to operate the equipment.